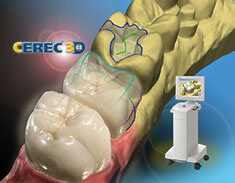 CEREC stands for Chairside Economical Restoration of Esthetic Ceramics -- in one visit! Very often, patients require large fillings or caps to be placed on their teeth. In the past, this was a tedious chore, where the patient would need to get a shot to be anesthetized, the decay and cavity removed, an impression was taken and sent to the lab. The patient would then have to return for another visit, get another shot, try-in the restoration, and if not correct, would go through the process again. With today's technology, such a unpleasant task is a thing of the past!! Using the latest equipment, the team at ProDent NY can produce an all porcelain cap or filling, in usually under 20 minutes! 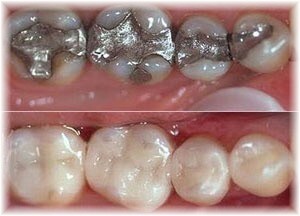 After the decay is removed, a digital picture is taken of your tooth. No messy impression material, which globs everywhere. Then, using the newest CEREC software, the doctor designs your restoration before your eyes. Any adjustments that need to be made, can be made via the CAD CAM software. Once the doctor and patient approve of the design, a color is chosen, and then the robotic arms precisely mill out the restoration to the specific dimensions. You leave the same day with your permanent restoration! No temporaries! No needing to come back for another visit! Your have more important things to do in life than to sit in the dentist's office! At ProDent NY, we want to help you live your life, not sit around waiting for it!